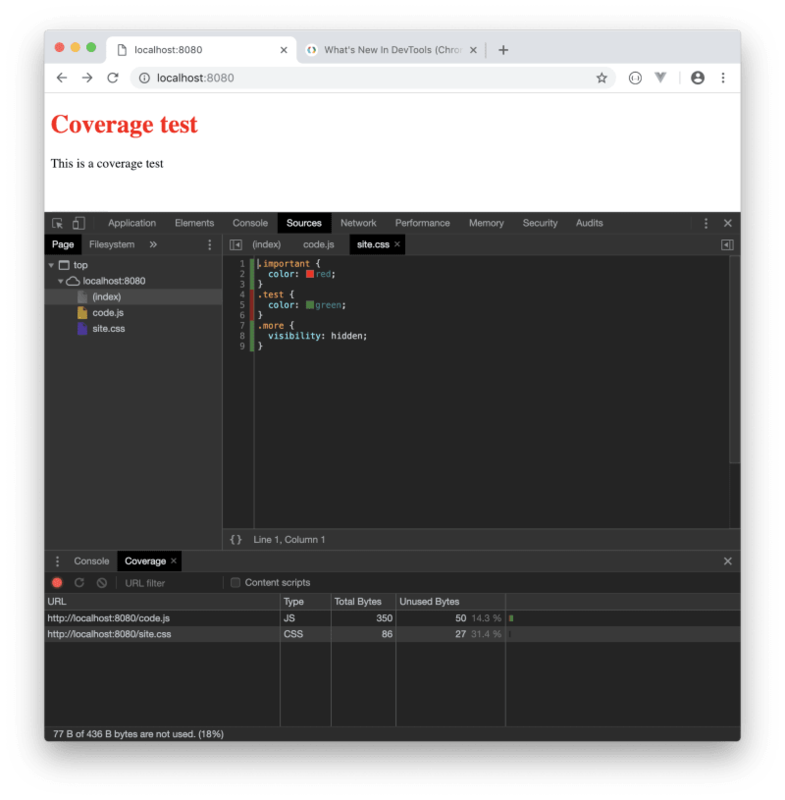 This article discusses how to run code coverage checks in Chrome DevTools as well as via Puppeteer in an automated way. 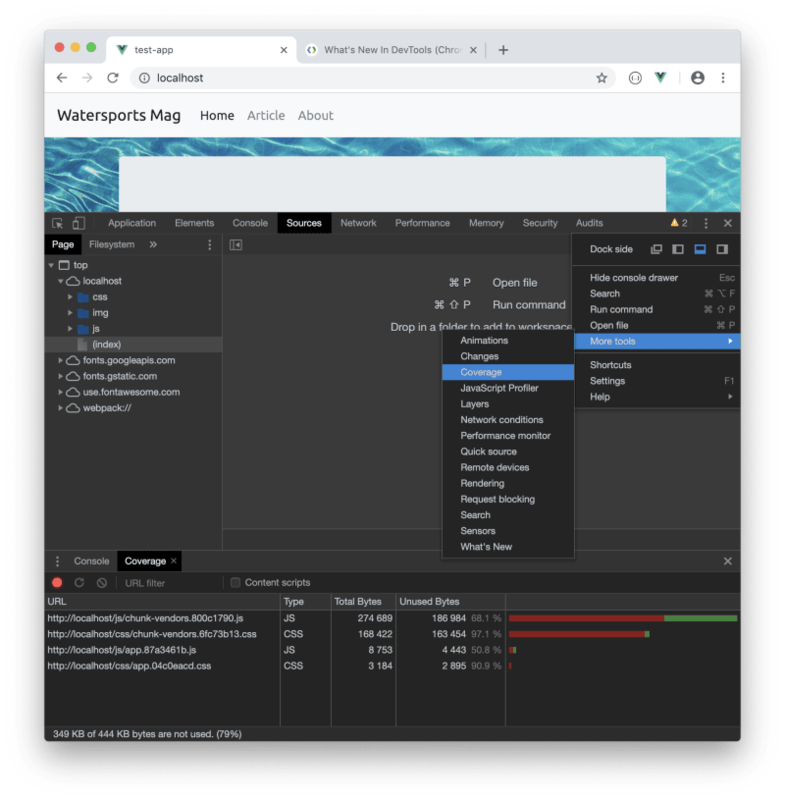 In this article, we'll review one of the latest additions to the Chrome Developer Tools as well as an interesting Node.js library that helps developers to work with DevTools in a programmatic way. Usually, when thinking about code coverage, we think about a percentage value indicating how automated tests cover much of the codebase. And this is absolutely valid - under most circumstances, this is exactly the right definition of code coverage. A prerequisite to having the coverage tab visible at the first place is to have Chrome 59+ installed. Enabling this tab is possible via the "Command Menu" in Chrome - which can be opened by pressing Cmd+Shift+P on a Mac or Ctrl+Shift+P on Windows and Linux. Once we have the Command Menu open, we can type in Show Coverage which will enable this feature for us. At the time of writing this article, there's no built-in feature in Chrome that would export only the code being used. But don't worry, there's a solution for that. Does this mean, that we can run the code coverage check as well? Absolutely, yes! The most important thing to note here is the ranges property because it helps us determine which lines are used by our application. Basically, bytes 0 to 28 and 55 to 86 are used by our application, which means that bytes between 29-54 are unused and therefore should be deleted from the CSS file in question. Using a combination of Puppeteer and the fs built-in Node.js module, we can write a small script that removes unused code and creates a new file with only the code that our application is using. At this point it makes sense to run all our tests again. Removing code certainly has its benefits as well as some side-effects. Make sure that your site is still functional before pushing changes to production.